Discussion in 'Backpacking' started by Dougcraft, Jul 13, 2018. It's been awhile since I've posted here- I hope everyone is having a fantastic summer. We just moved to Idaho and want to take advantage of the outdoor beauty of the Gem state. As such, I want to upgrade to some quality gear. For all around purposes, what are some good tent options? Broad question yes, and if there's a starter thread on this, I'm happy to be directed there (didn't see one after an arduous 2 second search). Basic needs- not too heavy, 4-6 person, 3 season capable, $300 or less. Sorry if these parameters are too wide open, but looking forward to responses. backlasher, Bitterroot Native, TrespassersWilliam and 5 others like this. I’m curious what’s suggested as I’d be interested in that too! Bitterroot Native, Glock Holiday, Winterhorse and 3 others like this. Some discount 4 person options. No experience with large capacity backpacking tents. Winterhorse, Dougcraft, Bobsdock and 1 other person like this. Plus one on Sierra trading post they have some great deals. Kellty makes a good tent in your price range. blind & lost, Winterhorse, Dougcraft and 1 other person like this. Your wants are almost self cancelling I would suggest a pair of two or three man tents for several reasons. Four persons might be doable six persons and backpacking is hard to make happen at that price point. One fine day I would like to have a Kifaru or Seekoutside tipi which would give tremendous space for the weight and pack size not to mention the stove option. Fit in smaller spaces than one large tent. Check Campmor they have some decent clearance deals. I have personally had good luck with my Eureka Tents. Midwest.Bushlore, ReallyBigMonkey1, Bitterroot Native and 7 others like this. ReallyBigMonkey1, blind & lost, M.Hatfield and 4 others like this. I'll second the suggestion of going with a pair of tents. I don't see any way to keep a 4-6 person tent light weight. A 3 and 2 person tent would be more versitle and make finding sites suitable for the tents footprint more manageable. How many people will be going with you on trips? Will the tent(s) weight be split between backpackers? How far are you planning to hike, and how many days? Will your group always be the same size? Does anyone use trekking poles? These can be used in place of tent poles on some tents to save weight and space in your pack. If part of the concern is gear storage, most backpacking tents come with vestibules which are covered areas just outside the door for gear storage. Packs, shoes, and anything without a sent to it can be stashed there and kept out of the elements freeing up room inside the tent for sleeping. If you're backpacking with kids you can generally stash all the gear you want at their foot end taking advantage of their height. I actually fit myself, my two sons, and all of our gear minus food, cooking gear, and toothpaste inside tent that is marketed as a 2 man. The rest goes up in a bear bag. clueless on the delaware, GoKartz, gohammergo and 1 other person like this. I should have been more specific on the number of people. I don't need a light tent for 4-6 people; I just want the space to accommodate 3 + dogs and stuff. I don't necessarily need it for backpacking either. I guess I'm fully exposed as a camping rookie! I do like the Sierra Trading Post prices; I'll keep my eyes open at Cabelas too. Bitterroot Native, M.Hatfield, TrespassersWilliam and 1 other person like this. Couple of smaller tents with a tarp strung up between them (I guess it depends how friendly you are with your dog)? 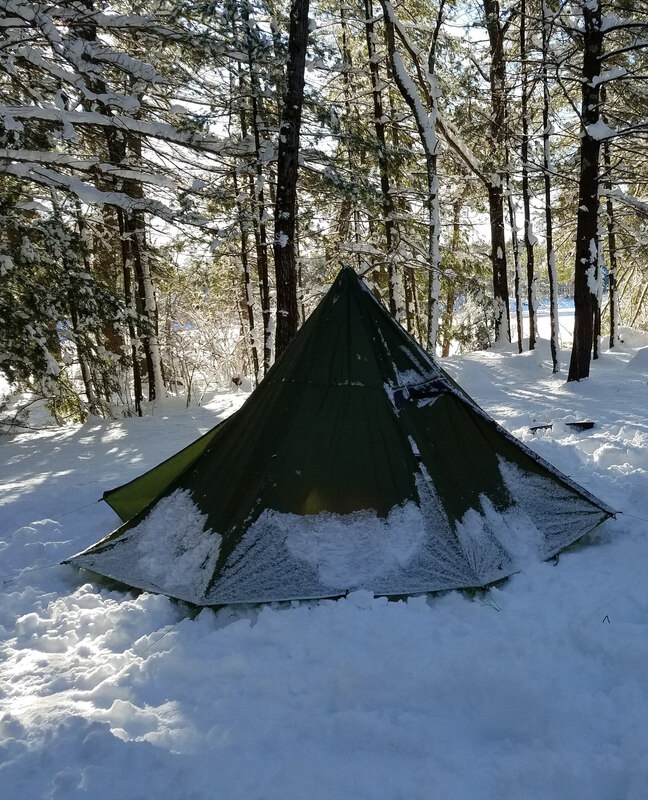 Large pyramid tarp (a la MLD SuperMid)? I think people assumed you were looking for a backpacking tent because you posted in the Backpacking section. superpaco and GoKartz like this. Plenty of options if your not backpacking, slightly higher price but it will last a lifetime and survive the weather. With the dogs,put a tarp in the floor of whatever buy. I have a Kodiak brand truck tent and it has been very reliable, breathes well and has never leaked, even during a couple of frog stranglers. Their wall tent are supposed to be very good. bosque bob, Winterhorse and Dougcraft like this. I just want the space to accommodate 3 + dogs and stuff. Luxe Octopeak - $275 -- outer tent only (6-person), less than 3 pounds. You can use trekking poles for the center pole or suspend it from the top tie-out if you are near trees. No floor = good for dogs. If you plan on getting the floor + inner / screen tent (4-person) -- it will be a snug fit. A new version with a snow skirt is planned for this November. Bushcraft Outfitters is also planning a tipi tent -- so you might want to wait and see what they surprise us with. ReallyBigMonkey1, M.Hatfield, Winterhorse and 2 others like this. A gear vestibule really is the best way to deal with stuff. If the dogs and people aren't too big, otherwise I think you're spot on with a 4-6 person tent. You'll definitely want to go with something with a full coverage fly. I'd measure out the floor space for each of the tents you look at and size it out at home. Lay out your sleep systems and see how much space that leaves behind. It may seem tight, but remember generally you are only going in the tent to sleep at night. We go camping to spend time in the great outdoors after all. I've seen people convince themselves that a 3 man tent is just enough for one person. M.Hatfield, Winterhorse and Dougcraft like this. Take a look at the Snugpak Cave thats on the trade blanket right now, thats a killer tent and priced under $300.00 and way below retail. Couple thoughts. How buggy is it? Can you get by with just a tarp or 2? If you're car camping, then I've been impressed with the Eureka Timberline series. For car camping, there's a tent by Field & Stream that is essentially a pop-up. I think I paid $125 for mine. Lots of great direction here! Thank you. Keep 'em coming. Im Sure you will enjoy whatever you get but ask yourself a couple questions before you buy. Is the purchase only for car camping? If yes buy a tent you can stand up in and walk not crawl into and out of. Are those going with me as enthusiastic as I am? If not see above, the more homelike it is the more they will enjoy it. Do you plan to backpack camp? If you only want to buy once and want to backpack also get two small tents and put a tarp over both. Great comments. At first, it's most likely to be car camping, or off trailer camping. For backpack camping, it will be with equally enthusiastic fellow trekkers. So at the end of the day, as I'm sure is true for most folks here, I'll end up with a few different tents/shelters. If you're car camping you can go the stupid heavy route and save yourself some money on something thats quality but just happy. Lots of good recommendations already like the REI Kingdom, some of the base camp Eureka tents and really even a properly seam sealed Coleman tent will suit you fine. Save your money for a quality backpacking tent. To get anything good that you'd be OK hiking with will cost you some coin unless you get a good deal on a used one. Yup sounds like you'll need two tents eventually. One for the dogs and family and you and one just for you. I'd worry more about quality, design, and space for the first tent. Keep in mind larger tents tend to be prone to water leaking in foul weather. That's why I stated you'll want a full coverage rain fly. You shouldn't need to set up a tarp over your tent, if you do the tent is not doing job. I've got a 1 man, 2 man, another 2 man that I use for 3, and a 3 man that I use and a one man that I'll probably let one of my sons have when they are older. Camping gear has a tendency to multiply. But each has it's use from solo backpacking or with other hikers who have their own shelter, to backpacking with one or both of my sons, or car camping with both of them. I would look for the one with the most screen area on the inside and the most complete rain fly coverage we have 3, 2 man tents 2 north face rock 22 and tehey have been bulletproof tents doors on either side of the tent as well as vestibules on both sides with full rain flies. The other is a eureka and has one door and one vestibule and the backside rain fly only comes about 3/4 of the way down and I have had leakage issues in the rain. all 3 tents are essentially fully screened inners. I would also recommend aluminum poles over fiberglass having been a scout master for many years I have help jury rig more than one split fiberglass pole but the only issues I have had with aluminum poles is stretched out shock cords. For car camping just get a 10x10 pop-up tent by Field and Stream, Dicks sells them. You'll never want another car camping tent after using of them. Dougcraft and GoKartz like this. I can spend an arm and a leg on knives but for camping gear I’m cheap, lol. For car camping you can get a lot of tent from Wally World easily for under $100 or even under $50 depending on the style that you want. Growing up I had a no name 2 person square tent that lasted years of camping until it disappeared during a move. A lot has to do with if you take care of your stuff. Get out there and make some memories. Editing to add I just re-read your post. If I had $300 to upgrade I’d get the best I could find too REI has a few nice tents online. I’d double check the denire on them. I was checking right now and it varies per tent. The higher the better and less likely it will tear on you. Those Field and Stream tents do look pretty nice. I tested out a few other tents at Cabelas and there are definitely some nice options out there.